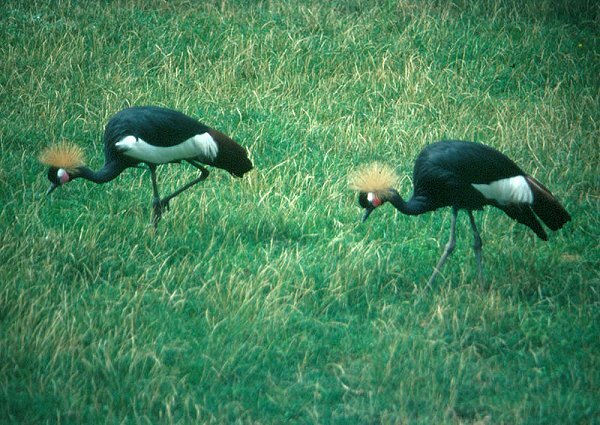 The Black Crowned Crane, Balearica pavonina, is a bird in the crane family Gruidae. It was once called also Kaffir Crane. It occurs in dry savannah in Africa south of the Sahara, although in nests in somewhat wetter habitats. 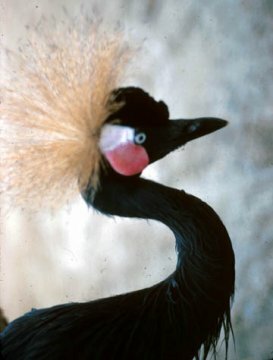 There are two subspecies: Balearica pavonina pavonina in the west and the more numerous Balearica pavonina ceciliae in east Africa. 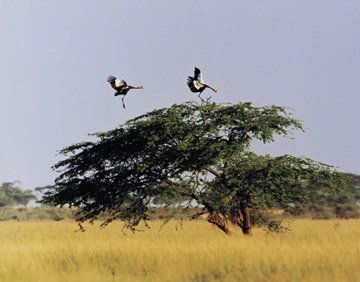 are the only cranes that can nest in trees. It is about 1 m long, has a 1.87 m wingspan and weighs about 3.6 kg. in the west, by habitat loss and degradation. and dark. The gular sac is similar to a wattle, except that it can be inflated. Legs, toes, and bill are black. are virtually indistinguishable, although males tend to be slightly larger. during the dry non-breeding season. vegetated wetlands. Females lay 2-5 eggs and incubation (by both sexes) lasts 28-31 days. Both parents guard the nest. alarm call if a threat is perceived. Chicks fledge (first flight) at 60-100 days.